To commemorate the life of the people princess. 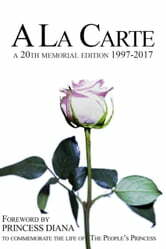 A La Carte Foreword by HRH Princess Diana This is a collection of Short stories by some of the greatest living names in English literature with a foreword by Princess Diana. Published and originally sponsored by Sir John Gielgud and John Le Carre in 1995. This book and Ebook is Raising funds for 'The National AIDS Trust', 'Great Ormond Street Hospital', 'Childline/NSPCC', 'Help for Heroes' and 'The Samaritans'.